Mom's Gone Bronson! : #switchtoturkey This Cinco de Mayo, with Jennie-O! #switchtoturkey This Cinco de Mayo, with Jennie-O! Disclaimer: I was provided with coupons in order to purchase and try out some Jennie-O products. All opinions are my own and your thoughts may differ to mine. Thank you! Today may be "Star Wars Day" but tomorrow is Cinco de Mayo and it is time to get together with friends and family for fun festivities and lots of yummy food! Jennie-O has a plethora of recipes for you to switch out your beef for turkey, this year, and so make that meal a little more guilt-free and a little more tasty all at the same time! Love tacos? Jennie-O has you covered! Fiery Enchiladas? NO PROBLEM! Jennie-O has a recipe for that, too! Whatever you need, including dips that everyone is going to love, Jennie-O has your back and is waiting for you, with recipes, over at their website! For under 500 calories, you could be eating Turkey Nachos, but for even less, at 300 calories, you could be eating Turkey Frittatas, instead - and you know, those are some of my absolute favorite things to eat AND happen to be approved by The Biggest Loser - they are even GLUTEN FREE! 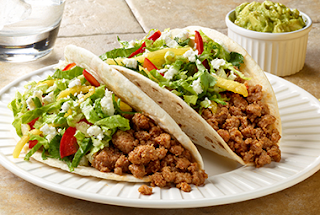 If you want to impress your guests, or make dinner for your family bright, then Island Turkey Tacos might be for you! These are simple tacos with Jennie-O's Savory Roast Turkey Breast Tenderloin with added spices and various peppers and more for color and decoration - not to mention taste and texture! They run at about 200 calories each and they taste amazing! You can find all of the current recipes on Jennie-Os website, and start cooking today! Personally, I am going to make some Miami-Street-Style-Turkey-Tacos and I am going to be stuffing some Jalapeno Peppers with Jennie-O ground turkey in a cheesy sauce, a little like poppers, but with meat and cheese instead of just cheese! 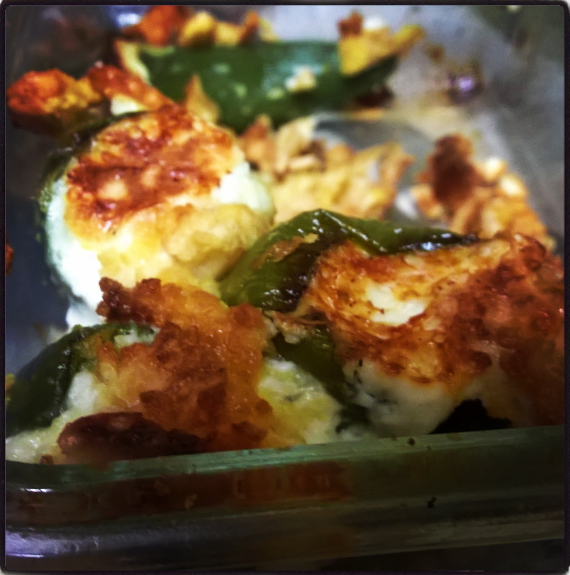 You just cut out the seeds of the jalapenos, stuff them and cover in breadcrumbs, stand them upright in a baking dish and load with extra cheese and breadcrumbs and bake unntil done. These go down well with the whole family - and the meat and cheese make for a nice sandwich filling or taco stuffing if your children do not like spicy jalapenos! Tip: Kids LOVE Turkey Nachos and they are easy to eat and not too spicy if you leave out the hot sauces or jalapenos. They are super-quick to make and taste great! What are you going to bring to the table this Cinco de Mayo? Whatever it is, give Jennie-O a try and switch to TURKEY!! Follow Jennie-O on Twitter to keep up to date with great new ideas and tasty new recipes! We love tacos in this house! I have never tried turkey meat in tacos, but now I just might have to! Thanks for the idea! Tacos are a huge deal in this house. The Jalapeno Peppers sound really delicious..I may have to try those myself!